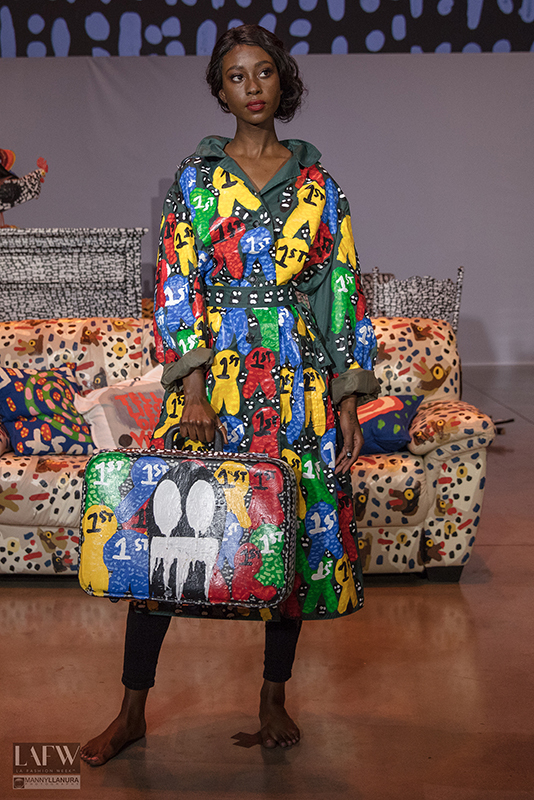 Los Angeles Fashion Week has become a platform on its own, and the 2018 Fall/Winter collections fell seamlessly into place with this year’s broad theme of cultural diversity. LAFW executive director Arthur Chipman, who is partly to thank for reinventing the L.A. fashion industry, welcomed a list of international designers and attendees; among them actors, musicians, artists, and royalty, from March 16 through 18. The “week” was even endorsed by Michelle and Barack Obama. Here are five designers whose message captured that spirit. Among the celebrities who have worn Pia Gladys Perey’s designs are Gabrielle Union, Angelina Jolie and Demi Lovato. 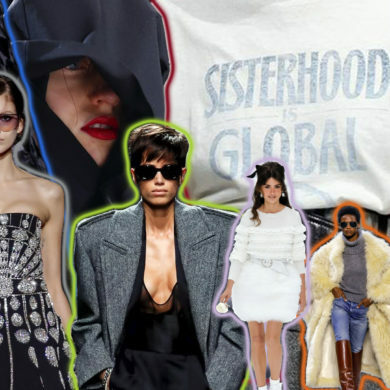 The designer is growing popular for celebrating a woman’s true form. This LAFW, she walked the runway with a special mission: the Shape Campaign, which is part of a “Modern Opulence” collection of dresses and other designs that Pia Gladys Perey customized for various body shapes. For example, a petite model with pulled-up, doll-like hair was adorned in a flowing Cinderella black dress; a plus-size Greek goddess-style dress gave the wearer the comfort and appeal to carry her catwalk confidently. Perey’s eyes light up with passion for the new campaign, and she is empowered by the possibilities that each body shape can create within the fashion industry. James carries a unique element that captures the audience’s attention. A red jacket and skirt combo adorned with white polka dots was both both edgy and classic. ‘The Bride of Frankenstein’, here in the form of a one-piece black dress, stole the show with an iconic towering hairdo. “I have to shock people. Hair is important. Fashion is a total package between hair, make-up and attitude. It’s all there,” James said. “When you think about the Dodo Bird or the Tasmanian Devil, these are species that are either under threat of genocide or went extinct. So, we need to think about, were they really ‘dodos’ or did they exist the way we exist now? We come in and then we go out,” Mayfield said. 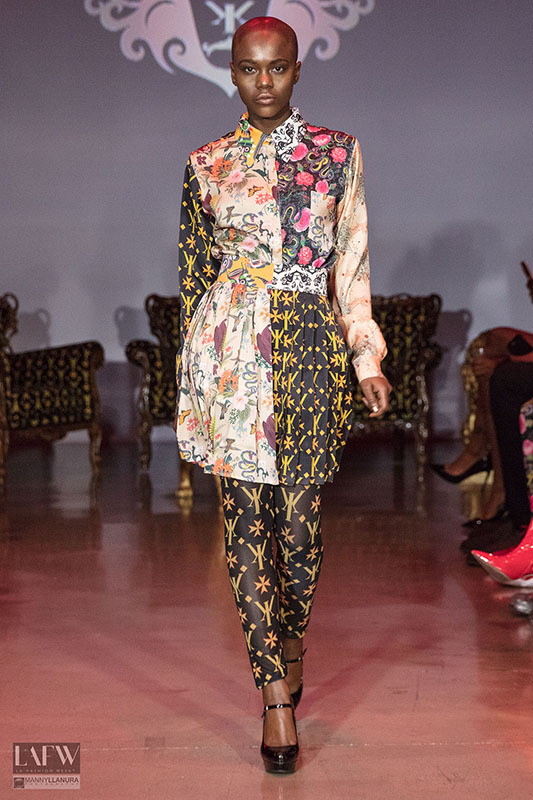 A kaleidoscope of colors and graphic design adorned designer Martez Malone’s collection, whose seamless worldwide vision was silky, modern, vintage and ethnic with no exact influence or map. The models sat beautifully on a Persian-looking sofa and chairs, almost reminiscent of African royalty with lions sculptures by their side. The ‘Y’ in the Yekim repeatedly adorned the furniture print, as some models completely blended in while seated. “It’s my biggest fashion show to date,” Malone said. Next, he plans to show at New York Fashion Week and to develop the brand internationally. Our breath seemed to freeze during the Michael Leyva closing show, as the rhythm of organ music transported the audience from the Beverly Hills Neue House to a cathedral of angels. 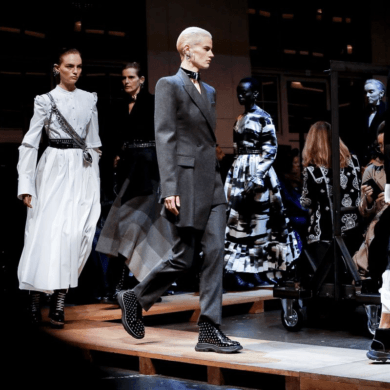 The show’s spiritual message was bold enough for the designer to add all the sparkle he desired — ball gowns adorned each woman, who paced slowly on an emulated cathedral aisle. 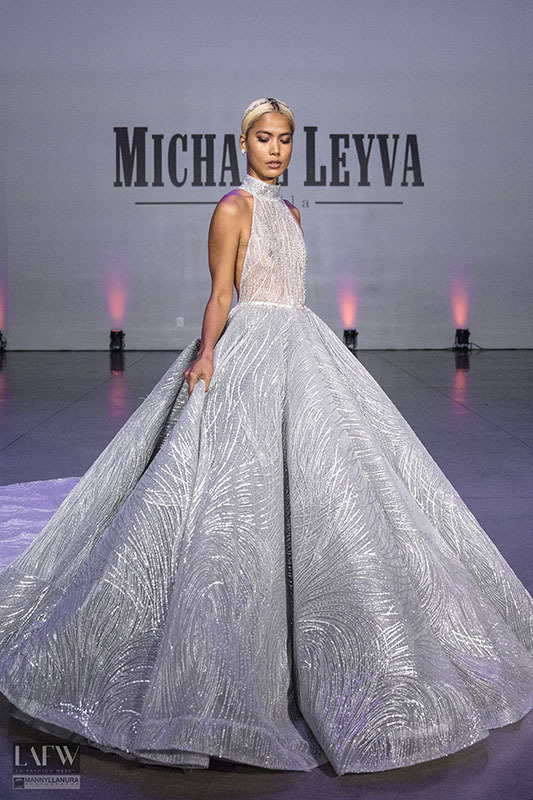 Leyva glamorously embellished the entertainment capital of the world with a show that was reminiscent of vintage Europe, Hollywood red carpets and Oscar storytelling. A new Los Angeles design platform was born — or perhaps its presence only emphasized — as less than a mile away, the Hollywood sign gleamed as the show came to a close.